The quest to bring ultimate relaxation into one’s abode is not only the prerogative of single-family home owners. We chat with apartment and condo dwellers all the time, and they yearn for the same luxury. It just so happens that at Olympic Hot Tub, we have five ways to meet the challenge. #1 – Have a small patio or balcony deck outside a sliding glass door in your condo, townhouse, or apartment? You shall not be denied! 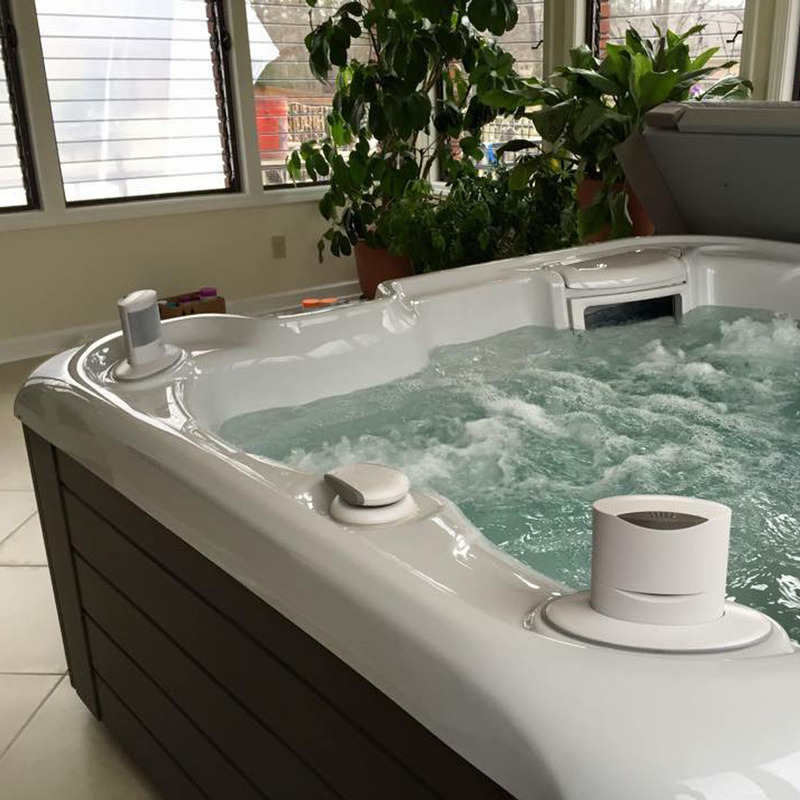 The makers of Hot Spring Spas have designed a hot tub just for you called the Hot Spot TX. It’s triangular in shape, tucks neatly into a corner of your patio, and it only extends 5’8” from the back center to the outer edges. There are ten delicious jets (plus the patented Moto-Massage that sweeps up and down your aching back) to massage you in so many wonderful ways. Easy-Installation is the TX’s middle name. It simply plugs into a standard (15-amp 110v) household outlet. And, since the TX is built to accept the EverFresh Water Care System, you’re able to soak in water that’s virtually chlorine-free. Our TX features the SilentFlo® 5000 circulation system that’s quiet as a whisper (it won’t disturb anyone’s sleep, including your neighbor’s) and gentle on your electrical bills, providing clean, hot water 24/7. #2 – Another patio-perfect two-person hot tub for your condo is the Mini® by Freeflow Spas. No custom installation is required. Simply fill it up with a garden hose, plug it into any standard 110v outlet, and relax! The Mini® features energy-efficient EcoFlow™ technology for maximum performance requiring less energy, and the optional Everfresh Water Care System for crystal clean water that’s virtually chlorine free. Even though the Mini® has a small 6’ by 3’11” footprint, you can still stretch out in comfort with lounge-style seating or sit side-by-side with your partner – and enjoy the 10 strategically placed attitude-changing jets. Did we mention…? Both the TX and Mini are also narrow enough to deliver to upper floors in an elevator! #3- If you think a good sweat in a steam sauna is a sweet way to start your day, Finnleo Sauna’s Hallmark Series has the answer. It’s called Simple Pleasure, and it’s simply perfect for small spaces. It will rid your body of impurities in steamy wonderfulness, yet it only takes up four square feet of unused space. Standard features include recessed ceiling reading lights, color light therapy when an attitude adjustment is needed during our dark Northwest winters, and a stereo sound system so you can sweat to your own music. The Simple Pleasure plugs into a standard 15 amp or can be upgraded to a dedicated 20 amp outlet. And no plumbing, or finishing work is required. Just plug it in, sweat it out, and enjoy! # 4 and #5- If infrared therapy is your idea of sauna bliss, we have TWO options we think you’ll love. The S820 Duo™ Finnleo Infrared Sauna is a mere 3’ 9” deep and 4’ 3” wide. Equipped with Finnleo’s patented CarbonFlex® infrared panels, the S820 offers the safest infrared therapy available today. And compared to cheaper units you might find on the web, Finnleo’s UltraPure heating provides therapy that is virtually free of radiation emissions. If you want to get your sweat on, in an ultra-small unit, the S810 Solo™ model is the sauna for you. It does not compete for space, asking that you only provide 3’ … which is about as big as a phone booth. You do remember phone booths don’t you? When this little sauna is called upon to deliver an energizing sweat, there are no wrong numbers! No special wiring is required for either sauna. Just plug them into any basic household outlet. We’ve just reviewed five wonderful ways to receive the therapy you deserve. If you live in an apartment, townhouse, or condo…now you can dare to relax large! Take the first step, and visit us online to discover your nearest showroom today!